It's week #3 of May which means it's time for your surprise! This month's surprise is what I like to call a Member Perk. It's a little gift + discount just for my members. This month's perk is a free moodboard template to use in your branding projects, courtesy of Fearless Confetti. Click here to download your moodboard template. They're also giving you 30% off their entire shop! There, you'll find brand board templates, social media templates, moodboard templates and more. 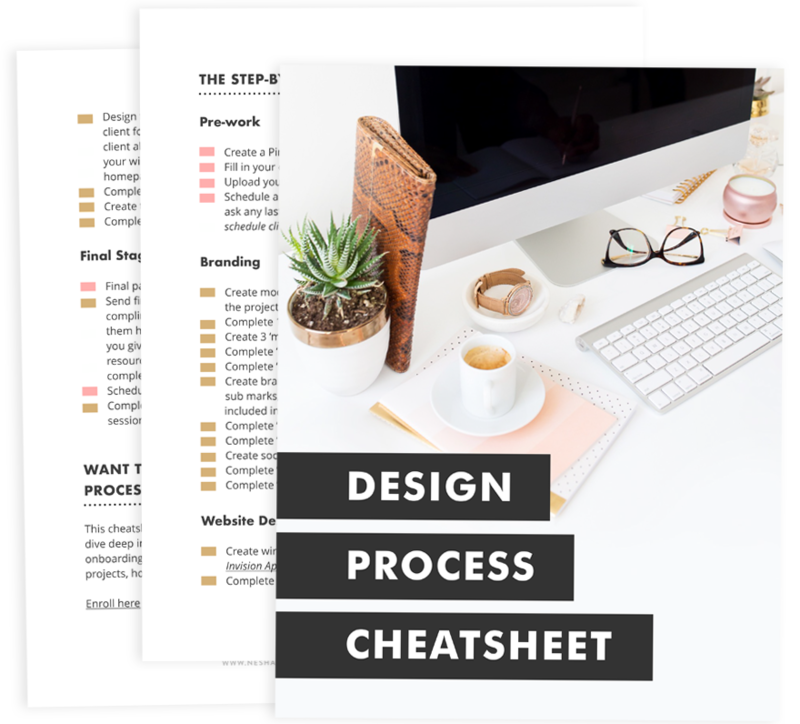 They have every template you need to make designing easier. Use the code NESHA30 to apply your discount! 1. Open the template in Photoshop. 2. Open a photo in Photoshop. 3. Drag the photo from its tab into the moodboard tab. 4. In the layers panel, drag the photo above the section of the moodboard you want to insert it in. Here's a video of how I create my own moodboards. This free template will work in a similar way! I welcome you to post them in our Facebook group! This month's masterclass is called 'How To Market Your Design Services On Instagram.' My cohost, Liz White of the Linea Mae design studio, finds most of her clients via Instagram. In this masterclass, she shares her best tips for turning likes and followers into paying clients! Be sure to follow her beautiful Instagram account and watch her stories to see how she works her marketing magic. Keep your business and personal accounts seperate. Almost everything you post on your business account should be centered around what your followers (aka. potential clients) are interested in or struggling with. We hate to break it to you, but your potential clients are most likely not interested in seeing a dozen photos of your dog, as cute or fuzzy as he may be. Keep your really personal photos on a seperate account. Both Liz and I have a business account and a personal account. Our personal accounts are followed by only our friends and family, and we keep it on Private so our business communities can't follow us there. Click here to see Liz's favourite stock photo resources! Liz's Instagram profile and website are branded and perfectly lead on from each other. She uses photos that include the same colours as her website or the same themes as her website photos to achieve this. If your potential clients are photographers for example, find a hashtag they use often, such as #risingtidesociety. Then search that hashtag on Hashtagify to see related hashtags. Why Does Your Insta Profile Only Attract Other Designers? In short, it's probably because you're following a lot of designers and using a lot of hashtags designers love. The first step to attracting non-designers is simply to unfollow the designers you currently follow and start following potential clients. You'll find that a lot of them will follow you back! Especially if you leave a thoughtful comment on one of their photos. Unfollowing other designers also ensures you don't get stuck in the comparison trap. Goodbye fraudy feelings! Treat your Insta posts as mini blog posts. Provide your followers with lots of free value that's connected to what they're struggling with, then link that Insta post with an opt-in to get your followers onto your email list. The best way to get noticed by a potential client on Instagram is to direct message them. Reply to their Instagram stories. No one replies to stores, so doing this will help YOU stand out! In this month’s masterclass we talked with my special guest, Liz White, about how to market your design business on Instagram. Preview App- Free of charge. Use this app to plan your Instagram feed and schedule your posts. Mosaico- Small one-time purchasing fee. This is an alternative to Preview App. Stock Photography- Like the look of Liz’s Instagram profile? She mostly uses stock photos. Check out her recommendations by clicking this link. Liz’s Instagram- Want to see Liz’s Instagram profile? It’s awesome at converting followers into clients and email subscribers! Nesha’s Instagram- Check out my Instagram profile and follow me to watch my daily Instagram stories. Liz’s sweet spot isdesigning sales pages (and boy, is she good at it!). To learn more, visit her website or check her out on Instagram!